Jean Joyner Newans taught music in this school for sixteen years between 1948 and 1964. The schoolhouse is now owned by Chris & Chris Ellis. School Section Oxford-on-Rideau No. 6 was formed when two small log schoolhouses united in the 1850s. Land was purchased from John Selleck for three pounds, and the salary of the teachers ranged from $200 to $250, paid at the end of the year. There were about 50-60 students, and as many as 80 students in the winter. The log schoolhouse was donated by Mr. William Evans of Oxford Mills circa 1900. It was dismantled and rebuilt inside the Blockhouse Museum in Merrickville. Entrance to the museum, right beside the canal, is free. 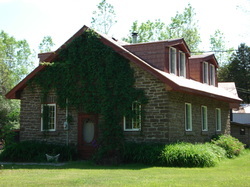 The schoolhouse was renovated in June 1976 by B. Headley and Associates. Inside are desks facing the exterior walls. This type of desk was common in Quebec and Ontario one-room schools during the 1880s so students could make use of the natural light. The present stone school, built in 1905 on land purchased from A. Norton Percival, replaced the old building. 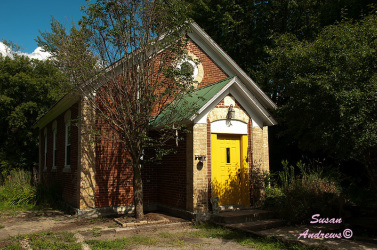 It closed in 1964 and became the meeting place for the North Grenville Historical Society. The building was sold in 2011. In 1873, trustees of S.S. No. 7 Oxford purchased one-half acre of land from Peter Straider for 15 dollars. A stone school was built with windows so high off the ground that pupils had to jump up and hold onto the windowsill to see outside. Water had to be carried daily from the Flood farm. Rabbits and groundhogs ate what was grown in the school garden, as people were rarely there to tend to it in the summer. The school closed in 1964 and students were bused to the new school in Oxford Mills. It is now a private residence owned by W. Lenk. 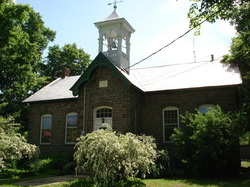 This two-room stone school was built in 1875 with stones from the Harris quarry. The first principal was W. Thompson who taught sixty pupils, with another sixty taught in the adjacent room. On June 3, 1925, over a thousand former students came together to celebrate the fiftieth anniversary of the school. In 1964, all the pupils from the twelve rural schools in Oxford were sent to the new brick Oxford-on-Rideau Public School at the northern limits of Oxford Mills. S.S. No. 8 Oxford became a library, and is now a heritage building and community center. The original log school was replaced in 1879 by the brick one-room building. In 1964, it ceased to be a school and became a private residence which is now owned by Susan Andrews. Agnew Johnston, a former Moderator of the Presbyterian Church, was educated at S.S. No. 13 Oxford.